We connect Michigan State business talent with top employers. Our career management team supports, advises and coaches students to realize their career aspirations, while working with leading employers and alumni to send our Spartans across the world. The devoted career advisors at the Lear Corporation Career Services Center provide individualized and progressive career search support and targeted resources to MSU undergraduate students preparing for careers in business. The center’s career services and resources run the full gamut from in-person support to virtual tools designed to empower students to navigate to their successful future. The Graduate Career Management Center is dedicated to providing a high level of personalized services to MBA students, M.S. students and employers. We partner with students in connecting their professional aspirations to their future careers through a full suite of services and resources that include support for career planning, networking, resumes, cover letters, interviews and more. We are here to help you develop a customized plan to establish, grow or maintain your company’s presence with Broad graduate and undergraduate students. Take a look at our data gathered annually on student outcomes. 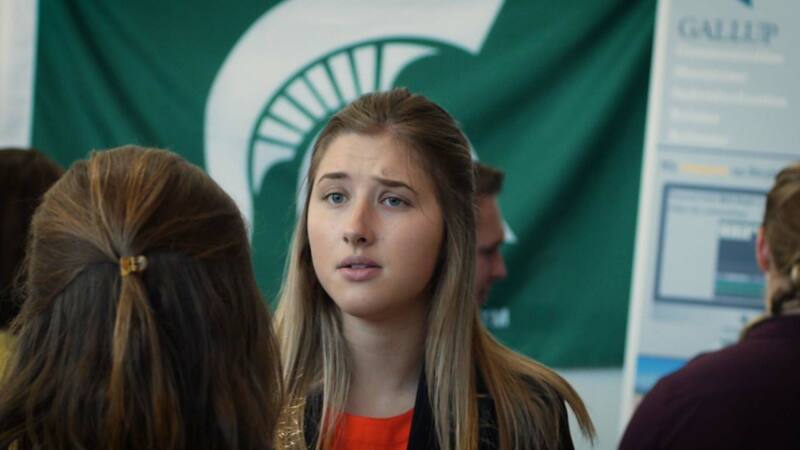 Surveys provide an overview of Broad College of Business and Michigan State University students’ involvement in student organizations, internships and full-time placement. Reports include the Destination Survey, Internship Report and university reports. Our undergraduate corporate partnership program serves as a group of companies and their representatives selected to serve as a communication channel between business/industry and career services, assist in creating student development resources, assess educational needs of business/industry, and inform career services of trends in the labor market. Our partners and sponsors are below. Why does Stryker recruit at the Broad College of Business? Because Broad is focused on helping students to succeed in the real world. Why does Auto-Owners Insurance recruit at Broad? Steve Bohus says it's because Broad students make business happen. Why does GM recruit at the Broad College of Business? David Wenner credits the rankings and prestige of the college. Why does Bosch recruit at the Broad College? Janelle Hawes wants global thinkers, which is what students at Broad become after four years. Why does Plante Moran recruit Broad College students? Sarah Hurst hires Spartans for their excellent business acumen. Why does C.H. Robinson recruit at Broad? Natalie Dillon believes it's because of the Broad College's Global Sales Leadership Society.